The Isle of Man Aircraft Registry has announced the appointment of Gary Raby to the role of Chief Surveyor. Working with Director of Civil Aviation, Hartley Elder, Gary will be responsible for ensuring that Isle of Man registered aircraft conform to international standards including airworthiness, certification and maintenance. He has 25 years of aviation experience, initially with the Royal Electrical and Mechanical Engineers, followed by Manx Airlines (British Airways CitiExpress/BA Connect) where he progressed to Engineering Manager, responsible for a base maintenance facility for six years. Gary is currently employed in the Aircraft Registry as an Airworthiness Surveyor; he was recruited into the Department in October 2009 and has since undergone intense training coupled with the practical application of Aviation Safety Oversight, Aviation Regulation, Continued Airworthiness and Continuing Airworthiness Management. The Isle of Man Aircraft Registry has been highly successful in attracting business since starting operations on 1st May 2007 and has registered a total of 456 aircraft in its four and three quarter years since the launch. 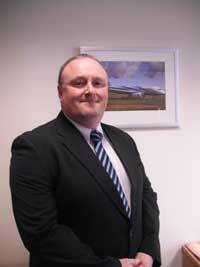 "We are very pleased to be able to promote from within our existing Isle of Man Aircraft team. Gary has developed his skills in line with the growth of the register which is now the seventh largest in the world. I wish him every success in his new role." "The transition from Licensed Aircraft Engineer to Airworthiness Surveyor involved a major change in my perspective of the aviation profession, however the change was assisted by the dedicated professionals within the Registry who aided my training in a clear and precise way. I am grateful for the help that they have given me and will ensure that in my role of Chief Surveyor this practice of rigorous professional development within the Aircraft Registry will continue." "My appointment as the Chief Surveyor of this globally respected Aircraft Register is the highlight of my career in aviation so far. In particular, I am looking forward to applying the management experience that I have gained from other areas of aviation to confirm and consolidate the Isle of Man's position as the premier Aircraft Register of private & corporate aircraft."